Pangong lake at a height of 14,270 feet ( 4350 m) is located eastern side of Ladakh region. From Leh town by road distance is 150 KM, this road passes through Changla Pass ( 17,586 feet ) which is third highest motorable road in the world. 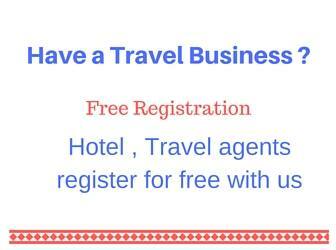 No inner line permit required for Indian nationals visiting Pangong Tso, however foreign nationals require Protect Area Permit ( PAP) which is to be applied through an travel agent of Leh. Indian nationals are required to carry one valid photo ID proof to be shown at ITBF check posts. 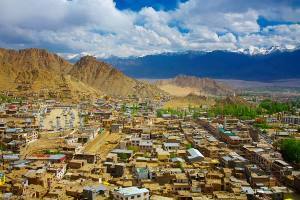 Start on Leh Manali highway and after travelling 35 KM from Leh you will reach Karu Junction . This is a small market place with all types of shops and restaurants. You can buy fruits, stationary items and medicines from here. From Kheru take left turn to travel towards Serthi village and Changal pass. Straight road will take you to Manali. After travelling 8 KM from Karu you can see Chemrey Monastery on your left side. The road starts climbing hill from Serthi village ( 12 KM from Karu Junction ) and finally after travelling 44 KM from Karu Junction ( 83 KM from Leh ) you will reach Changla pass. 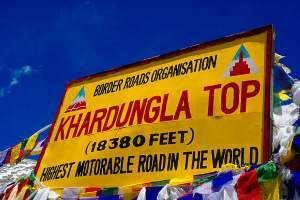 Changla Pass at a height of 17586 feet is worlds third highest motorable road. Spend some time here , all facilities like toilet , food , medicine, first aid are available here. There is a temple of Changla Baba is there. Height of Changla pass is less than Khardungla pass so chance of falling sick due to AMS (Acute Mountain Sickness ) is less here, however take all the precautions. 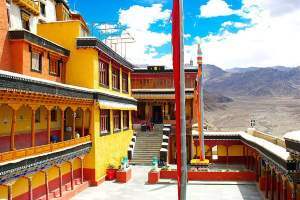 Don't rush to these areas after arriving at Leh by flight, take one day complete rest to acclimatize your body to low oxygen level. After crossing Changla Pass you will start descending and pass through valleys and hills. After 41 KM from Changla pass you will reach Tangtse village. 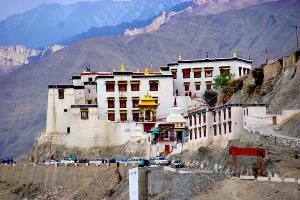 This is a beautiful village with a monastery ( Tangtse Gompa ) on a hill top and cultivation land all around. You can take lunch here, there are several restaurants available by the side of the road and inside the village. There are beautiful garden restaurants available inside the village with rooms for night stay. Room rents includes three time food in a day. Here village is self sufficient in using natural resources. Solar cookers are used to cook food. Water is taken from the flowing water stream through the village. Electricity is available during evening hours only, from 7 PM to 10 PM. From Tangtse village Pangong Tso is 33 KM. Between Tangtse village and Pangong lake you will see display boards cautioning you about Marmot crossing the road. You can spot them easily from the road. There are wire fence by the side of the road and tourist are not supposed to cross the fence and disturb the animals. After driving 45 minutes from Tangtse village, you will reach the Lake. Before 4 KM from the Lake you can get the first glimpse of the lake between two hills. You will cross Paagal Nala ( or Mad stream ). This stream changes its path frequently and damage the road. Part of this lake is in Tibet under Chinese control. This is a big lake and the road passes by the side of the lake, you can drive along this lake. After 3 KM from starting point of the lake there is a flat area where you can go for horse ride. This point is also known as film shooting point as several Hindi films are shot here. The Aamir Khan movie 3 Idiots and Shah Rukh Khan movie Jab Tak Hai Jaan are some of the famous movies shot by the side of this lake. The seen of Jab Tak Hai Jaan with Anushka's entry by jumping into the lake water is shot here. The last seen of 3 Idiots when his friends finally locate Aamir khan 10 years after they left collage is shot by the side of this lake. You can take photos by riding Yak by the side of the Lake. You can go for 15 minutes' drive by All Terrain Vehicle ( ATV ) available here. The track is sandy and you can enjoy the drive by the side of the lake. There are two types of vehicles and cost is Rs 600/- and Rs 700 for 15 minutes ride. The main attraction of this lake is its changing color, you can watch the clear water and see the color changing. There are several camps available near the lake for overnight stay. Mostly booking is done from Leh. Tourists usually reach here after 2 PM and stay overnight. Next day morning after breakfast they checkout and return to Leh. Some tourists starts early morning ( 5 AM ) from Leh and reaches here around 12 PM, after spending 2 or 3 hours they start returning to Leh without any night stay. Note that this place is cooler than Leh or Nubra Valley. Because of cold wind blowing here, carry heavy woolen dresses if you have planned for night stay here. 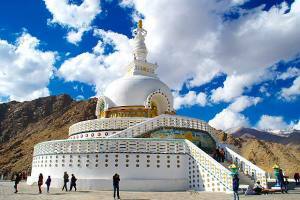 Without any stoppage in between it will take 4 and half hours to reach Pangong Lake from Leh. 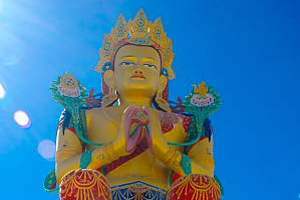 However you will be breaking for tea at Changla pass and for lunch at Tangtse , so it will take 6 to 7 hours to reach Lake from Leh. The water of Pangong Tso Lake is saline and there is no fish available in this water. Due to security reasons boating is not allowed in this lake. During winter months water completely freezes due to fall in temperature.